WWE announced Rusev and Lana will take on Andrade "Cien" Almas and Zelina Vega on the SummerSlam Kickoff on August 19. Over the last two weeks, Vega has been able to pick up wins over Lana, thanks mainly to Aiden English attempting to help break-up fights outside the ring. A couple weeks back Rusev would also lose to Almas after being distracted by a brawl on the outside and English getting bumped into Lana by Vega. 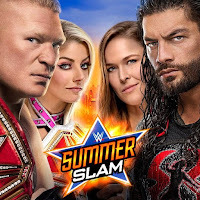 Click here for the updated SummerSlam card.